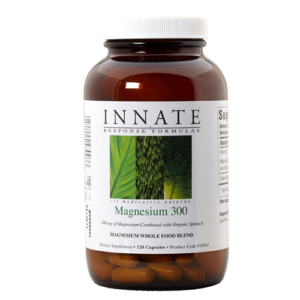 Magnesium 300 exemplifies the best of nutritional formulations by blending a therapeutic dose of the most well absorbed forms of magnesium blended with organic whole food. Magnesium is an essential nutrient required for proper functioning of nearly every system in the body. Among its critical roles are assisting with ATP production, promoting healthy neurotransmitter levels and cognitive health as well as cardiovascular support. 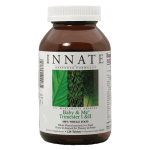 It is also necessary to drive enzymatic reactions and is a major contributor to the production of protein in the body. There have been studies demonstrating widespread deficiencies of this vital nutrient even in developed countries indicating the need for an increased intake of magnesium. Innate’s Magnesium 300 boasts the citrate, glycinate and malate forms, all of which have been shown to be well absorbed and helpful in restoring adequate magnesium levels. The infusion of organic spinach, a whole food magnesium source, provides a whole food complex to accompany the clinical dose of magnesium and optimize its utilization. 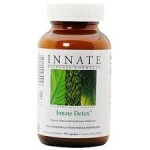 Magnesium is an essential mineral needed by just about every cell type of the body. More than 300 enzymatic processes in the body depend on magnesium. Hence, attaining optimal magnesium levels is an absolute requirement for optimal health. Whole organic spinach leaves are affectionately infused for its rich source of nutrients and phytochemicals. Magnesium 300 provides the best option for enhanced absorbability, bioavailability, and utilization for the path to optimum health.